The deets: J.Crew top; South Moon Under skirt (old); GiGi New York clutch via Bedazzles After Dark; MIA wedges (old); Lancome "Violette Coquette" lips; Essie "Going Incognito" nails; Necklace c/o DaisyGem. I decided that even though I'm not going to NYFW, I should still kick off the week in some fierce outfit to feel like I'm partaking in the excitement. I think I'd fit right in with my cheetah print top, leather mini, bold matte lip (just brush some translucent powder over your regular favorites for this effect), colorful accessories; and a staple fall polish shade (or a girl can dream right?). What would you guys wear on your imaginary fab trips to NYFW? Also if anyone is planning on going to Georgetown's Fashion Night Out let me know, I'd love to say hello! such a great look E! you look so pretty. & loving that cheetah print top with that skirt! wish i was going to NYFW too, dang school! I too can only dream of going to NYFW. But you are so ready for it in this outfit. I love the pink necklace on the animal print. Girl, you look great! Love the whole outfit!!! I so wish I could go to NYFW, too. Maybe some day! Fabulous! 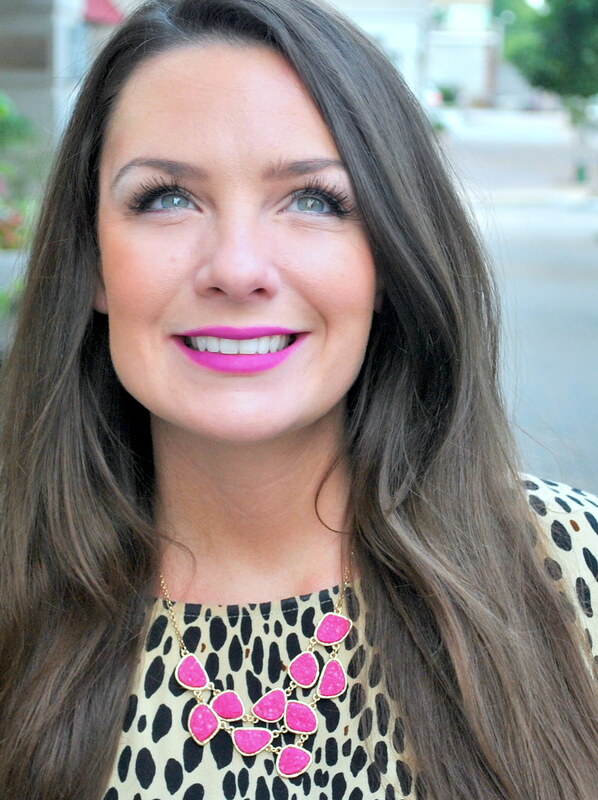 Loving you in this fierce lip and sassy leopard print! 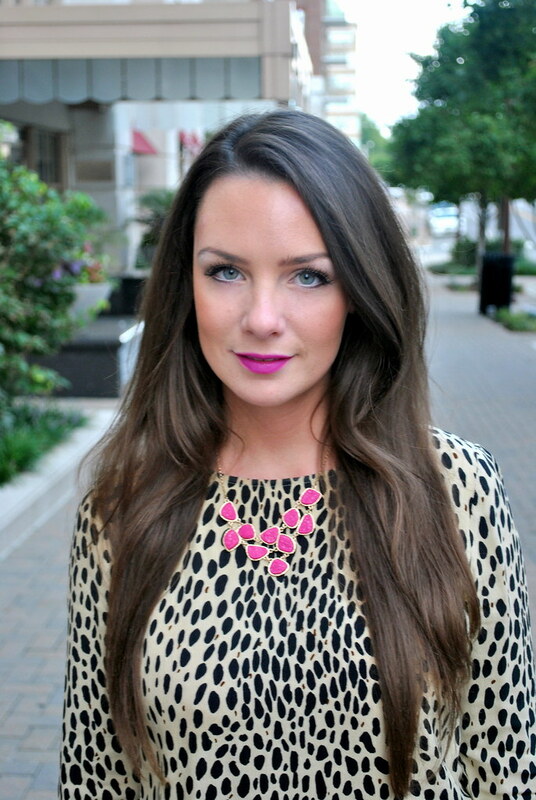 Love everything about this outfit, especially the leopard and pop of pink from your necklace! Stunning! You look insanely gorgeous!!! I'm seriously in love with that skirt!!! I need a leather skirt baddd! Love how you matched the pink lips, clutch, and necklace! You look amazing! LOVE the skirt and the top together. Definitely super chic and fierce! Cute blog! Love your style! Newest follower! xo. you look AMAAAZING! the outfit is perfect and the lip color is absolutely gorgeous! I have that top in dress form and absolutely love it! It's definitely something I would wear should I go to NYFW (which I'm not...womp womp). However, this is the first time I'm living in the city during fashion week, so I'm excited to see all the excellent fashion running around on the street! Love the outfit!! Great pink accents! I will probably be hitting up FNO in georgetown as well! Hey, girl, hey!! You look stunning...Love the pops of pink. And I wish I were in NY right now too. A girl can dream and imagine, right? Love the outfit Erin. You look gorgeous as usual! Cute. Cute. Cute. Such a great casual/chic look! BTW... thank you so much for the sweet comment on my blog several days ago. LOVE reading them. I love that top, and the pink accents are perfect! I love your FW look. I think you would steal the shows! LOOOVE that lipstick, so fun!! I'm thinking about going to Georgetown's Fashion Night Out! Which stores are you planning to swing by? PS -- LOVE that skirt paired with a long sleeve top. Just the right amount of skin for NYFW. you look gorgeous ! i love your lipstick ! erin you ALWAYS look gorgeous!! i seriously want to save for like a whole year and then have you shop for me online. is this possible?! I'm serious! i love your style and feel like its totally my style too! though most days I'm in a uniform. either way, you are gorg girl! love this look! happy FNO! Very fierce look! Love the skirt!